At Carson Veterinary Clinic, we understand that the bond you and your beloved feline friend share is invaluable and irreplaceable. We also understand that by nature, cats are roaming creatures and therefore run the risk of wandering too far from home, or just accidentally losing their way. In fact, a staggering number of cats are lost in the shelter system each year because they lack any means to identify them with. This is why we are happy to offer cat microchip identification services. Microchipping cats hurts about as much as having blood drawn. 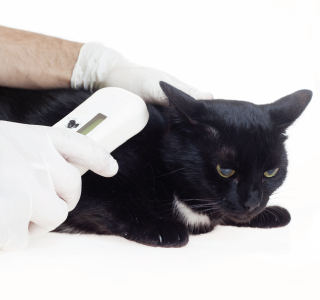 The microchip comes preloaded in a sterile applicator and is injected under the loose skin between the shoulder blades.The needle is required for the injection causes a pinch during cat microchipping procedures. Because it is only a momentary injection, no local or general anesthetic is required. Because it is quick and fairly non-invasive, the cost of cat microchips is very reasonable.